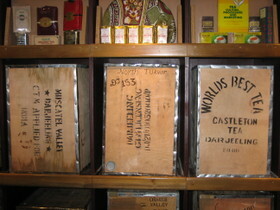 No visit to Darjeeling is complete without a visit to Nathmull's, the best tea shop in the city. I learnt that the family that owned Nathmull had split up and the two brothers were both selling tea under the same name. I strolled into this store which had in stock a nice variety of the 2nd flush (2nd picking ) from the neighboring tea estates. Darjeeling tea is considered to be the finest tea in the world by tea connosieurs and I decided to spend the afternoon to find out exactly why. I spent the next three hours on a memorable tea tasting journey. The store clerk started me off with the low end Darjeeling teas which were so much better than the gravel I had been drinking all these years. 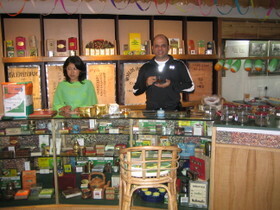 By the time, I got to their finest teas, I had already had 10 cups of teas and was literally bouncing off the walls! Instead of just sipping and sampling each individual tea, I had been drinking entire cups since the teas were so good. The thing about Darjeeling tea is that it begins to taste better as it cools down so it's hard to leave a cup half empty! I also learnt for the first time the real technique to preparing Darjeeling tea, which is also outlined on their website. I bought 100gm to 250 gm samples of three different types of tea that I liked the most to see how they would taste with the water in Mumbai. I must say that I like all of them!! If you are into fine Darjeeling tea, you can order them online from the website above and they will deliver anywhere in the world. My picks: Gumtee 2nd flush 2006 & Castleton 2nd flush 2006. Thanks for the nice write up on our tea showroom in Darjeeling. It offers a Tea Menu with almost 75 kinds of teas .. the gest can sit down & enjoy the same in the backdound of soft & soothing musi. Ornamental tea pots & sets, strainers, infusers, tea cosies, paintings, artifacts books & other tea paraphernalia are on display & some even on sale.